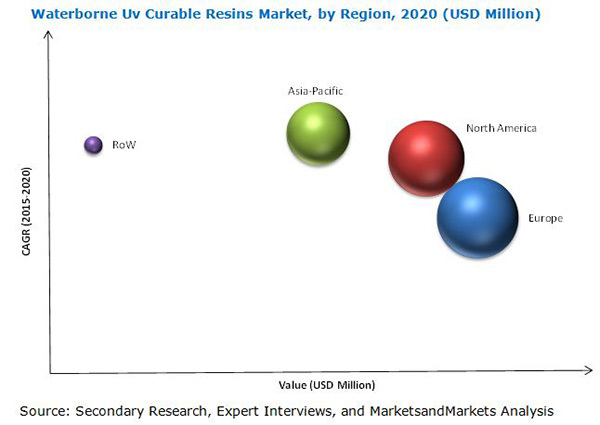 [126 Pages Report] The waterborne UV curable resins market recorded a market size of USD 122.2 Million in 2015, and is projected to reach USD 230.3 Million by 2020, growing at a CAGR of 13.52% from 2015 to 2020. The waterborne UV curable resins industry is witnessing high growth on account of increasing applications, technological advancements, and growing demand of waterborne UV curable resins in the European and North American regions. Waterborne UV curable resins are largely used in wood coating applications. The rapid growth of the market is driven by environmental concerns and increasingly stringent regulations. This study aims to estimate the market for waterborne UV curable resins for 2015, and project its demand by 2020. It provides a detailed qualitative and quantitative analysis of the market. Various secondary sources, such as directories, industry journals, and databases, have been used to identify and collect information useful for an extensive commercial study of the market. Primary sources, such as experts from related industries and suppliers, have been interviewed to obtain and verify critical information, as well as to assess prospects of the waterborne UV curable resins market. To know about report assumptions, download the pdf brochure. The value chain of waterborne UV curable resins begins with raw material manufacturers, followed by waterborne UV curable resin manufacturers, waterborne UV coating manufacturers, and end-use industries. Maximum value is added during the waterborne UV coating manufacturing stage, as the coating process knowledge is proprietary, protected by patents, and expensive owing to additional heating required to evaporate the water before UV curing. “The study answers several questions for stakeholders, primarily which market segments to focus on in the next two to five years for prioritizing efforts and investments and the competitive landscape of the market”. The market is further analyzed according to key countries in each of these regions. The waterborne UV curable resins market, in terms of value, is projected to reach USD 230.3 Million by 2020, growing at a CAGR of over 13.52% from 2015 to 2020. The key drivers of the market are environmental concerns, growing awareness, and increasingly stringent regulations for VOC emissions. Dispersions of urethane acrylates (UV-PUDs), often combined with physical drying acrylic dispersions, are being widely used in the European furniture coatings industry, and are also finding growing acceptance in the North American market. Wood coating applications are estimated to witness the best demand growth prospects for waterborne UV curable resins. Waterborne UV wood coatings are estimated to account for approximately 10% of the radiation curable wood coatings market. Their key application areas are furniture coatings and hydro primers for industrial parquet. Given their low viscosity, waterborne UV wood coatings enable effective penetration of the wooden pores and provide excellent adhesion. They allow so called open-porous structures. They are fashionable in wood coatings, as they make a coated wooden surface look as natural as possible. Europe is the largest market for waterborne UV curable resins, followed by North America and Asia-Pacific. The market in Western Europe is estimated to record high growth, due to stringent regulations for waterborne UV curable resins. Factors restraining market growth include the need to thermally dry sensitive substrates and high set up cost which remain a limiting factor in the proliferation of waterborne UV curable resins in wood applications. Moreover, the waterborne UV curable resins market is consolidated and competitive, with a number of small-to-medium scale players, especially in China. The market is dominated by various players, depending on their core competencies. The key players in this market are Allnex Belgium S/A (Belgium), Alberdingk Boley GmbH (Germany), Royal DSM N.V. (The Netherlands), BASF SE (Germany), Covestro (Formerly Bayer MaterialScience) (Germany), Nippon Gohsei (Japan), Wanhua Chemical Group Co. (China), and Miwon Specialty Chemical Co. Ltd. (Korea). New product launches and investments & expansions are the key strategies adopted by industry players to achieve growth in the waterborne UV curable resins market. Each of these strategies accounted for a share of 40% of all the growth strategies adopted by market players from 2010 to 2015. The rising demand for environmentally friendly wood coatings, coupled with the high growth of the plastic coatings industry in developed countries, prompts companies to adopt this strategy. Market players are focusing on entering new markets by launching technologically advanced and innovative resins for different applications. 11.8 Wanhua Chemical Group Co., Ltd.
11.9 Miwon Specialty Chemical Co. Ltd.